I have to remind myself that not everyone knows the location of Hovenweep National Monument. It is one fairly small US National Park site of about 390 in the western hemisphere, and it’s hard to get to. You really have to want to come here, because it’s just not on the way to anything. Hovenweep National Monument is actually a series of small parcels of land scattered across the southeast corner of Utah and the southwest corner of Colorado. It’s a bit confusing to people, I think, for several reasons. First off, a lot of people think that only places with “National Park” in their name are actually national parks. Actually, the National Park Service system includes National Monuments (NM), Nat’l Historic Sites (NHS), Nat’l Recreation Areas (NRA), Nat’l Memorials (N MEM), National Seashores (NS), Nat’l Historic Parks (NHP), Nat’l Battlefields (NB), Nat’l Scenic Trails (NST), and a few oddballs like the John D Rockefeller Jr Memorial Parkway (near Grand Tetons). All told, there are about 390 sites in the United States, plus a few in US protectorates like Guam, Samoa, Virgin Islands, and Puerto Rico. The number keeps rising as new parks are being authorized all the time. To make things more confusing, this national monument is surrounded by another national monument: the recently-formed Canyon of The Ancients Nat’l Mon. So as you are driving from one “unit” of Hovenweep NM, you are also in and out of Canyon of the Ancients. But wait, there’s more. Some national monuments are not in the Park Service system, but instead are administered by the Bureau of Land Management (BLM). Easterners are often not familiar with BLM, but out here in the west BLM owns vast tracts of land, which is often open to recreation, mining, and drilling. BLM Nat’l Monuments often are just open space with a few primitive 4WD roads and no developed facilities (such as a Visitor Center or campground). Sonoran Desert Nat’l Mon in Arizona is one example, and so is Canyon of the Ancients. 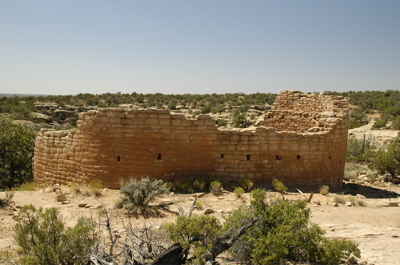 At Hovenweep, the Visitor Center and campground are in the “Square Tower Unit” of the park, located in Utah. Today we drove northeast to three other units where more ancient Puebloan ruins can be seen. 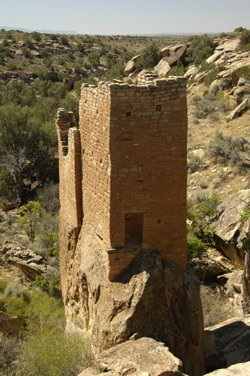 The Horseshoe & Hackberry Unit, Holly Unit, and Cutthroat Castle Unit are all located just 4-9 miles away, but they are in Colorado, and they are within Canyon of the Ancients Nat’l Monument. This results in an interesting study of how the two government agencies administer their land. The Hovenweep units are fenced, have better signage, pit toilets at every trail head, and are more closely monitored. Camping is prohibited except at the campground we’re in. There’s also a day-use fee to access any part of Hovenweep. The rest of the land is BLM, and the rules are less clear (and possibly less restrictive). There’s no fee or services in the BLM’s Canyon of Ancients Nat’l Monument. The only site that can’t be reached by car is Cutthroat Castle. You can get most of the way in with a car and then hike down to the sites, or if you have a high-clearance 4WD vehicle like us, you can have an interesting drive down and hike just 0.1 miles to the site. After doing three other hikes, we chose the interesting drive. 4WD Low Range all the way and it was great fun. Because of the BLM/NP borders, it happens that the exceptional “Painted Hand” pueblo ruin is also on the same access road as Cutthroat Castle. Because it is on BLM property (and thus part of Canyon of the Ancients NM), the brochure you get at the Hovenweep Visitor Center doesn’t even mention it, and it’s not depicted on any of their maps. But it’s right there, almost impossible to miss as you head to Cutthroat, and you must visit it. Painted Hand has towers, kiva depressions, pictographs, farming terraces, and great views. Best of all the round-trip hike is less than a mile. I’m glad we visited Mesa Verde first, so we knew what we were seeing. We’re still alone here. We did see one other couple visiting some of the ruins today, but other than that it has seemed as though this is our own private national park. We could really stay another night, but we’re juggling our desire to visit Capitol Reef and other places as well. One limiting factor of this park is that it has no dump station, and because of the remote location they ask that we take all our trash with us as well. With careful conservation, those factors won’t force us out for a few days, so the choice is ours to make. My wife & I were wondering how much it would cost to tour the US for 6 months or so when we retire. People from both the US and Europe often figure that although they can’t quit their jobs and wander forever, they can budget six months or a year for a grand tour of America and then return to their previous lives. Our friends Bobby & Danine are in the final months of doing exactly that. It’s a good concept, because many people can break away from their careers for a while than can take their careers on the road with them. And as I can attest, it is quite a juggling act to manage a job while trying to get the full travel experience. Having toured around for three years now (our anniversary is later this month), I’ve gotten a feel for how long it takes to really see something in the USA. Six months is a reasonable amount of time. You won’t see “everything” by any stretch, but you can enjoy quite a few of the highlights of this country. With six months you can easily drive from coast to coast and back, and have some quality time at perhaps two dozen major stops. Three or four days is enough to enjoy a major national park, and if you really want to dig in for a couple of weeks the option is available just by trading off against some other place. You can also make lesser visits for a day or two to many more places. The real problem is that many people get out for a six month tour and find they want more. That’s what happened to us. Four months into our six month trip we decided to extend for another full year. Then we did it again, and now here we are 36 months later still living in an Airstream. In my opinion, a year is much more appealing than a shorter trip. Frankly, if you’re going to take a leave of absence just once in your career, you might as well make it a good one. Will it really make much difference to your career if it is 12 months versus six? With a full year you can experience the northern and southern portions of the country, even Canada, and stay in reasonably warm weather all the time. … we appreciate that there are literally dozens of options that would change one man’s experience from another. That’s true, of course, but we can offer some generalities to help with the budgeting process. First off, the largest cost may not be fuel. If you buy an RV for the trip and then sell it at the end of the trip, your biggest expense may be depreciation (the difference between what you buy it for and what you sell it for). You can minimize this expense in a few ways. Start with a used RV. It will already have the heaviest depreciation years behind it. Take a longer trip. The longer you own the rig, the cheaper the depreciation cost becomes on a per-day basis, because the depreciation curve tends to flatten over time. Keep the RV and continue to enjoy it on weekend after your trip is over. Then the depreciation cost is factored over your entire ownership period, which could be many years. Renting is not a financially viable option for long trips. The RV rentals are structured to people going on limited vacations, not full-timing for months at a time. Fuel is a major expense, but even today it is not a huge one if you don’t drive maniacally around the country. In our first year and in Bobby & Danine’s first year we both hit around 18,000 miles. It was more than we had both estimated, too. It turns out that this country has a lot of nooks and crannies, and so if you just figure 3,000 miles across each way plus a “fudge factor” you’ll greatly underestimate the trip. 18,000 miles over a year is not an enormous amount of driving. The typical American commuter manages 15,000 just going back-and-forth to work and running errands. Yes, at $4 per gallon (and figuring 10 MPG), you’ll spend $7,200 on fuel. But consider all the other expenses you won’t have, that offset it: you won’t spend a penny on commuting to work, you can close up your apartment or house and reduce your costs there, you can reduce to one vehicle (saving insurance and maintenance expense), and you’ll probably buy less “stuff” because you won’t have a place to put things you don’t absolutely need. After that you’ve got campground expense (very budgetable because you know you’ll need one almost every night), and then you get into personal choices like eating out, going to theme parks, or indulging hobbies. Maintenance and repairs play a role in the budget but needn’t be huge unless you have a disaster. The rest is normal things you’d face if you were home: medical care, food, insurance, clothing, cell phone, etc. Excluding depreciation expense, I would bet most people could take a six month tour of the country for less than $18,000 without any trouble at all. Consider what a package tour anywhere will cost you, especially on a per-day basis, and suddenly you can see that even with higher fuel costs, a six-month tour of the country might be less of a dream than you thought. Last night while talking with Alice and Tim, a commonly-asked pair of questions came up, which are: How do you set your schedule? and How do you choose where to go? If, like most people, you work in a fixed location and only travel in the RV during vacations and holidays, you’re accustomed to having limited time to travel. This puts boundaries on your trip, which helps you determine how far you can go and how long you can stay. It’s really the same for us, only with larger boundaries. For example, having left Fort Wilderness this morning, we are finding ourselves in a situation that is very familiar to us. We have a certain amount of time ahead before we need to be somewhere, and only the vaguest of ideas about what to do on the way there. For some, this would appear to be a problem, but really it’s an opportunity. rallies or business obligations (meetings with contributors or advertisers, photographic assignments for the magazine, etc). When I don’t have information, we wing it. We figure that if we don’t have a plan, we have little to lose by just trying a spot at random. Often this is the way we find the best little-known spots. That’s what seems to be happening right now. Today marks the end of the plan that I developed in Tucson over a month ago. I planned to get to Disneyworld and then figure the rest out. Well, here we are, one day out of Disneyworld and I still have no followup. We’ve talked about it a little, and considered the options, but have no solid conclusions. I think we’ll just have to take it one day at a time. We’ve still got another day to consider things. We’ve moved the trailer over to Haines City, where our friends Bill & Wendimere live. They are giving us courtesy parking (with power to run the air conditioning, a key factor in Florida this time of year) for a couple of nights. We used to spend winters here in Haines City, so we are in a familiar spot both situationally and geographically. Car update: The new-old 1983 Honda is toodling along just fine. It’s extremely handy to have an efficient car to run around in, especially as we make side trips going up the east coast. I’m factoring that into our trip plan as well, since it enables us to make long detours using the Airstream as home base. Longer term, we do have a rough plan. It looks like this: June-July in New England; August heading west through Ohio and onward to Colorado; late August and September in Colorado and Utah exploring national parks; early October in northern Arizona; back to home base by Halloween. But keep in mind that life is what happens when you are making other plans. What actually happens to us this year may be completely different. We are just about ready to launch, and it feels strange. The house is at last usable, mostly. We finally got running water in the sinks just two days ago. We have window shades, working plumbing, beds, reading lamps, and a couch — things that make a house habitable. We have friendly relationships with our neighbors, paid-up real estate taxes, and flowers on the grapefruit tree. So why are we leaving? Because life is calling. Because we can. There are things out there that we haven’t seen, people we haven’t met, and experiences we can’t even imagine, if we just break away from the status quo, the comfortable house, and the safe backyard, to find them. At any moment something might change to prevent us from being able to get away (school, health, money). We’ve got this opportunity and who knows how long it will last? But I have to admit that I am sorry to leave this soon. This is one of the perfect seasons in Tucson, and will continue to be for another couple of weeks, at least. The weather has been spectacular, the hiking is prime, everyone’s in a great mood, and there are dozens of great things to do all over the area. I’d like to stay and enjoy it all, and the house, for just a little longer, but choices had to be made and we have already stayed much longer than we had originally planned. The delay in departure has meant a few things have fallen off our travel itinerary. Padre Island in Texas got dropped. Our service stop in Weatherford TX at Roger Williams Airstream got dropped. We cut a week out of our Florida stopover, and shortened Big Bend National Park from 7-8 days to just 4-5 days. We’ll probably skip right through GA and SC to get to NC’s Outer Banks. You can never escape the imperative of compromise. Today I completed 90% of my departure checklist and found a little time to do some trip planning. I use Mapquest to rough out the route, then pick out spots we want to visit and people we want to see. I was surprised that I had the temptation to make reservations at various state parks along the way. In the south, it is still high season at many places (through mid-April or even mid-May depending on location), and so reservations aren’t a bad idea. But as I’ve written before, we find that reservations tend to force into an overly-rigid schedule. So I didn’t make any reservations at all. … although I wouldn’t mind if our next few adventures involved cool stuff, rather than mechanical problems. I am really hoping for a few months of no tire problems, and no expensive failures. To that end, one of my tasks in the morning will be a very careful undercarriage, tire, and hitch check. Since I’m on the subject of maintenance, I will toss in an update on our tow vehicle. I get a lot of questions about it from blog readers, and I don’t mention it much because there’s little to say. The Nissan Armada has been highly reliable. We have 63,000 miles on it, of which I estimate about 55,000 miles are towing, and it is still happy. We had the in-depth 60K service done last December and it got a clean bill of health from the dealership. I wish it got better fuel economy (9-10 MPG towing, 15 MPG not towing), but in all other respects it has proven to be a reliable and competent tow vehicle. However, I should say that for a longer trailer like ours, I think the Hensley Arrow hitch is essential because of the short wheelbase of the Armada (23″ shorter than the similar Nissan Titan pickup). Without the Hensley the handling of the 30-foot trailer was not nearly as secure at highway speeds. I mention this because I also get a lot of queries about our hitch. It has definitely saved us from a few “adventures” of the negative kind over the past couple of years. Interestingly, Ron Estrada of Hensley Manufacturing told me last December that 14% of Hensley owners had Airstreams. Considering that Airstream is only about 2% of the overall travel trailer market, that’s a pretty heavy endorsement by Airstream owners. Maybe we just like to spend money, but I think it’s because people who appreciate Airstreams also appreciate good design in other things. If you want one but don’t like the new price, check the bulletin board at a major regional or national Airstream rally and you may find a used one cheap. In Perry GA at the WBCCI International Rally last summer I spotted two with asking prices around $500. That’s a steal for a Hensley. Of course, at that price I’d expect it to need refurbishing, which I believe the factory will do. If all goes well in the morning, we will be off around 10 or 11 a.m. Our plan is to keep our drive under 250 miles on travel days, so it will take us two and a half days just to get to Big Bend National Park in Texas. I’ll start providing coordinates of our camping locations again starting tomorrow. Wish us luck. Getting ready to go out again has almost been as much work as the first time we did it, back in mid-2005. I took the opportunity to complete a few projects that would be easier done while stationary, and they have taken over my life. The first big on was to set up real mail forwarding. For a long time we’ve had a sort of unofficial mail forwarding deal set up in our former hometown of Ferrisburg VT. I knew this couldn’t last forever, and finally got around to finding a new mail forwarding service for our personal mail and Airstream Life magazine’s mail. Moreover, most of them couldn’t figure out how to handle Business Reply Mail. I ruled those out right away — if they had no idea what it is or how to deal with it, I didn’t want them. For example, I ruled out Earth Class Mail for that reason. To get your mail received by a private mail box service, you need to fill out a USPS Form 1583, and it has to be notarized. Since we receive mail under our personal names, our corporation name, and trade name, that meant three notarized forms. Then of course the official Change-Of-Address forms for every name. Then a new Business Reply account application, a second form to receive the proper artwork for our Business Reply Cards and Letters, and checks to the Postmaster and the mail service to get everything started. So I’ve been having a grand time. I know where Green Cove Springs is, but we’ve never been there. I think we may drop in during May just to see what it looks like, and to meet our friendly postal gnomes. Another project has been to do something about my glasses. I’ve worn glasses since 3rd grade and as you might imagine, this makes me something of an aficionado of them. When we were parked in Aurora, CO back in 2005 I splurged on a $500 pair of Silhouette frames with all the fancy add-ons, anti-reflective, anti-scratch, super lightweight polycarbonate lenses with hinge-less, flexible arms. They weighed nearly nothing and were almost invisible on my face. They also drove me crazy. The anti-reflective coating scuffed off, the lenses scratched almost instantly from my camera’s viewfinder, and the arms were unadjustable. The coatings seemed to attract dust, so they were constantly needing cleaning. They didn’t fold into a standard glasses case so I had to use Silhouette’s special case, which soon fell apart. I had to use two hands to put them on because they didn’t have hinges. They moved out of position at the slightest touch of my camera. They were, in short, the prima donnas of eyeglasses, and more trouble than they were worth. They were also difficult to get repaired — most optical shops won’t touch them — and getting replacement lenses meant at least a two week waiting period (during which I would need a spare pair). Given our frequency of movement, that was unacceptable. I ended up getting a new eye exam two weeks ago and buying a “spare” pair of glasses at a cheap online eyeglass retailer. The new glasses arrived in five days, were a great fit, and cost me $40, shipping included (I used a 10% discount coupon). You know what? They’re great. The “spares” quickly became my primary glasses. Heck, for forty bucks a pair, I’ll order another pair and say goodbye to those fussy Silhouette frames. I also got contact lenses, for the first time since high school. Contact lenses are a lot better now than they were back in the Early Post-Disco period, but it has been so long since I wore them that I have to go through the awkward adjustment all over again. So I am spending 4-6 hours per day blinking like an owl and watching the world go all blurry as one of the toric lenses spins like a deranged clock. I’ll need to get through this before I can tow again. It should take about a week. Writing all this, I feel sort of stupid. These things I call projects are really just ordinary tasks of an evolving American life, and perhaps I am giving them too much credit. But when you want to get going, any little thing that takes more than one phone call to complete feels like a barrier. We’ve got places to go! We are enjoying the house, as much as we can without a kitchen or any appliances, and in some ways we’d like to stay longer, but there is also the call of the road getting louder every day. Whatever projects are left on the 29th will have to wait. We’re checking out soon. We have been only partially successful at avoiding Emma’s cold. Eleanor has a mild congestion, and I have a sore throat. Nobody feels 100% but at least we are mostly functional. But because we are dragging ourselves along and the days are so short at this time of year, it seems almost impossible to get anything done before sunset. This morning we meandered out of our campsite on the shore of the Colorado River in Needles, and puttered further along Rt 95 in the desert, eventually merging with I-10 south of Joshua Tree National Park. We had no fixed destination in mind. Along the way, we tried entering Joshua Tree from the south side, but the only campground in the park (Cottonwood, 4000 ft. elevation) was cold and windy and lonely. The ranger station was closed for staff training, there were no evening ranger programs within 30 miles, and I couldn’t blog or do any work up there since there was no cellular service. If we’d planned a couple of days in advance we might have stayed, but for an impulsive visit it didn’t make sense. We decided to skip Joshua Tree in favor of the warmer air down in the Palm Springs area. I think the virus is affecting our decisions. With a rhinovirus in your system, you want warmth and comfort food. You want plenty of hot water and early bedtime. You want a movie or a book in bed. You don’t want to go rock-hopping at 4000 ft. in a cold breeze 40 miles from the nearest pharmacy. Our adventuresome instincts have been blunted by the influence of a microscopic nuisance. However, this is an opportunity to talk about ways to avoid microscopic nuisances. (You’ll admire the smoothness of this segue in a moment.) Last week at REI I bought a Steripen, which is a little hand-held ultraviolet light that renders harmless all bugs that might be in your drinking water. You press a button, dip the light into the water, and in about 90 seconds it has scrambled the DNA of 99.999% of the viruses, bacteria, and protozoa in the water. Voila! Safe drinking water. So-called “purifiers” can knock out the viruses but they generally do that by introducing chemicals like iodine or chlorine. I like my water to contain only water. So I chose a two-step approach: fill the fresh water tank with well-filtered water, then treat it with the Steripen for drinking purposes. We use the Camco CX90 ceramic in-line filter on our fresh water hose whenever we fill the tank or are connecting to city water. This ensures the water in our tank and fixtures is not contaminated by sediment, etc., and it also improves the taste. The system works. Las Vegas water tastes horrible, but with the CX90 and the charcoal filter built-in to our Moen kitchen faucet, it was passable. I’m planning to use the Steripen when we go to Mexico next, and here in the USA it is also useful for those times when we are boondocking and need to make safe drinking water from the fresh water holding tank. Tonight the blog comes to you from the parking lot at the Spotlight 29 Casino in Coachella CA, right at the noisy intersection of I-10 and 86. We’re here with eight other RVs, laying low until sunrise, when we can get back on the road down toward the Salton Sea.